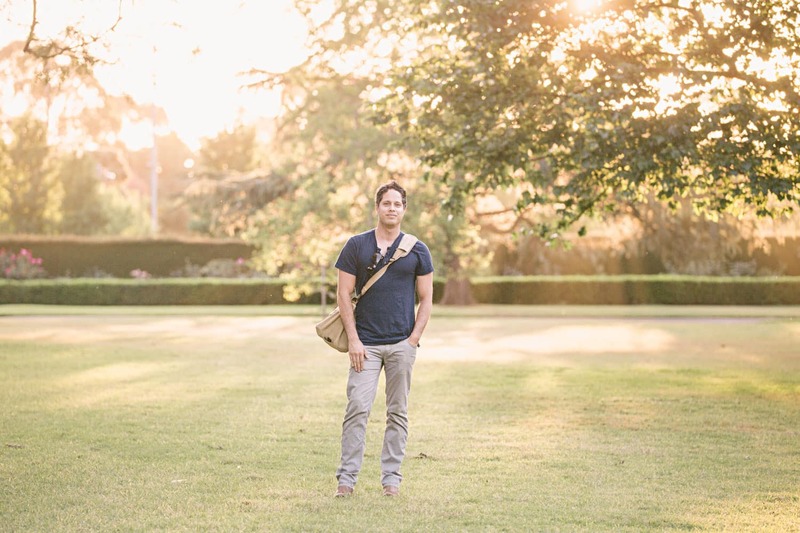 Daniel Bilsborough is a wedding, portrait and travel photographer from Melbourne, Australia. His travels have taken him to almost 60 countries, and his portfolio includes work from a variety of places including Africa, Iceland, the Middle East, Australia and Latin America. He’s also the founder of the djb photography school based in six cities around Australia, New Zealand and the USA. I’m Daniel Bilsborough, and this is How I Travel. Apart from experiencing geographic and cultural beauty from different parts of the world, for me the love of traveling is about getting to know new people. I’m affected and inspired most by direct experiences with human beings. Everyone has a story, and although at times I can be a bit of an introvert, I love human interaction. One of my closest friends doesn’t even live in the same hemisphere as I do, and we met while we were each traveling solo in Europe. When I think back, most of my “How did you meet?” stories with friends and ex-girlfriends are all connected by some kind of traveling experience. It’s also nice to escape the repetition of “normal” life; it gives me time to think. My entire business plan for the djb photography school came to me while traveling on an overland truck somewhere between Tanzania and Rwanda. In three ways: a willing acceptance of the unfamiliar, self-confidence, and open-mindedness (is that even a word?). Prior to ever leaving Australia, my entire world revolved around my little group of friends, my car and video games. And before you ask, I was too nervous to actually “talk” to girls. My geography skills were so ridiculously bad I couldn’t tell you what was north of Spain. Or where Spain was in the first place. Btw which way’s north? My first trip sparked my curiosity about the world, to the point that I actually started to care about everything I’d ignored in history class at school. How did World War Two start? Why do they speak Portuguese in Brazil? Why is America fighting wars in the Middle East? My “problems” and the things that make me angry/upset are so small and so stupid. Australia is one of the safest, friendliest, most beautiful countries in the world, and before I left for the first time I thought every country was similar. I thought all kids grew up without having to worry about their safety. It turned out that seeing imagery on the world news from my couch was quite different to being there and experiencing it. My first ever trip overseas was to Thailand. During my first 2 hours in the country my initial instinct was to walk outside the safe haven of my Bangkok hotel and experience the streets. The smells, the humidity, the sounds, the people. I remember being followed by a 5 year old girl holding a sleeping baby for almost 15 minutes. She’d tap me on the leg, look me in the eyes and put her hand out. Traveling has made me grateful for so many things that I thought were just normal, like being raised by a loving family and for the opportunities provided by education. Above all, it’s given me a great sense of perspective. What’s the one travel-related purchase under $100 that has had the biggest positive impact on you in the last 12 months? My “not a camera” camera bag. There’s a few places I’ve traveled to where you don’t want to look like you’re carrying $10K worth of camera gear around. I needed something that was durable, looked kinda unprofessional, and would give me easy access to my camera and lenses. I bought this little guy at a store on the banks of Lake Ashi in Hakone, Japan. I bring him out when I’m traveling and need to work. He stares at me angrily about procrastinating. I bought this somewhere in the maze of markets in the Medina, Marrakech. A small kid approached me and said he knows the best place for a checked scarf; he had a friendly face, so I decided to follow him. He took me to his uncle’s store and I loved the scarf, but soon after I bought it a group of eight kids came out of nowhere, surrounded me, and “asked” me to tip the little guy who brought me there. Now, I use this scarf all the time: on planes to cover my eyes, as a makeshift pillow case, and believe it or not, I actually like wearing it. This light is perfect for when I’m traveling and I have a photography job. I wouldn’t walk the streets with it, but it gives me a greater amount of control than a flash. I bought this microphone for one reason: high quality portable audio recording. Sometimes when I’m traveling I need to make screen recordings for my team or videos for YouTube, and this microphone beats any built-in mic by a long shot. I’ve owned many, many, many Crumpler bags, but this is my latest and my favorite one! It’s my standard carry-everything bag. One DSLR body, three prime lenses and my laptop if I need to. When I was living in Brazil, my host family took me to a place called Canela in Rio Grande do Sul. I bought this here, with força meaning strength in Portuguese. I have no idea what that Japanese-looking symbol means. I literally wear these things to sleep sometimes. I’ve stayed in places where it’s just so damn noisy that I put these on to dull everything down. They work best on a flight – after wearing them for a while you realize how loud a plane actually is. This app is for completely offline maps, no Internet connection required. If you just want to use your phone as a GPS device without a data connection, Maps.me is fantastic! I just bought a bunch of these Hammer Anvil slimline leather wallets because I like carrying the absolute minimum in my pockets. And they were great value on Amazon! I’ve gone through many different brands of rechargeable AA batteries, and so far I’ve found these to be the most reliable. I use them on my Apple Magic Mouse, my camera flash, the H1 mic and even my shaver. Fav On-the-Go ReadThe 4-Hour ChefIt’s not just about cooking, it’s about how to learn. I follow him on Facebook and he’s full of wisdom.